Daniel E. Miller led a tour from 13 to 29 June 2013 that was scheduled to visit locations in five Central European countries: Berlin and Dresden in Germany; the Saxon-Switzerland National Park in Germany and the Bohemian-Switzerland National Park in the Czech Republic; Terezín Concentration Camp and Prague in the Czech Republic; Vienna in Austria; Bratislava in Slovakia; and Budapest in Hungary. Unfortunately, flooding along the Elbe River required a detour away from Dresden, the national parks, and Terezín. Instead, the group visited Leipzig, Dessau (the home of Bauhaus), Weimar, and Buchenwald Concentration Camp. This was the eighth tour Dr. Miller led to Central Europe and the fifth time he did so in cooperation with Lenka Kocková, a Prague-based guide. The pair provided background on the history and culture of each city during a guided tour. Participants also had time to explore the museums, cafés, shops, and city streets on their own. Twelve participants took part in the tour: two undergraduates from the University of West Florida, including Dr. Miller's son, Martin; a recent UWF graduate; a student transferring from UWF to the University of Arizona; four UWF history graduate students; three residents from the Pensacola area; one resident from the northern part of Alabama, and one American ex-pat living in Sweden who also is a UWF alumnus. The original advertisement for the tour is available here. 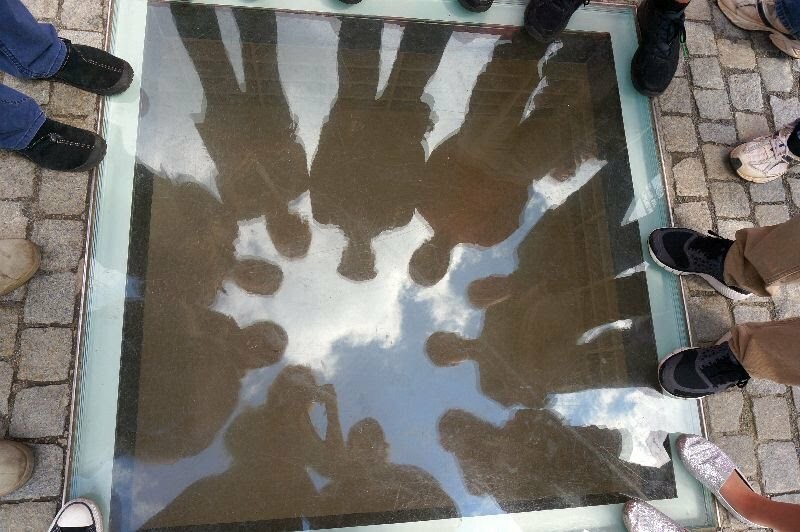 Members of the tour contemplate the empty bookshelf memorial on Bebelplatz, Berlin, Germany, where Nazis burned 20,000 books--the same number the empty bookshelves of the memorial can contain--on 10 May 1933. Photo courtesy of Amanda McGlothlen. 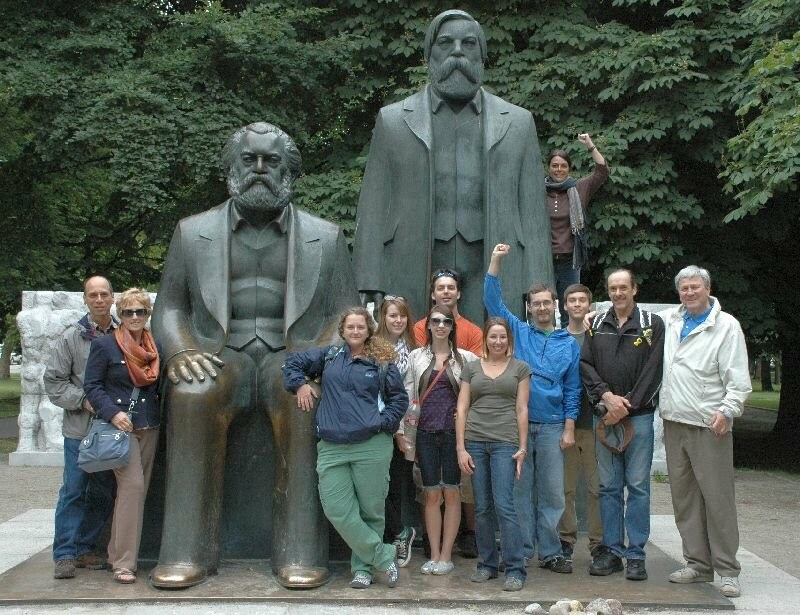 Monuments to Karl Marx (seated) and Friedrich Engels (standing) from the communist era in former East Berlin provided a perfect backdrop for a group picture. A view of the Dancing House (Tančící dům, 1994-1996) during a dinner cruise on the Vltava (Moldau) River in Prague, Czech Republic. 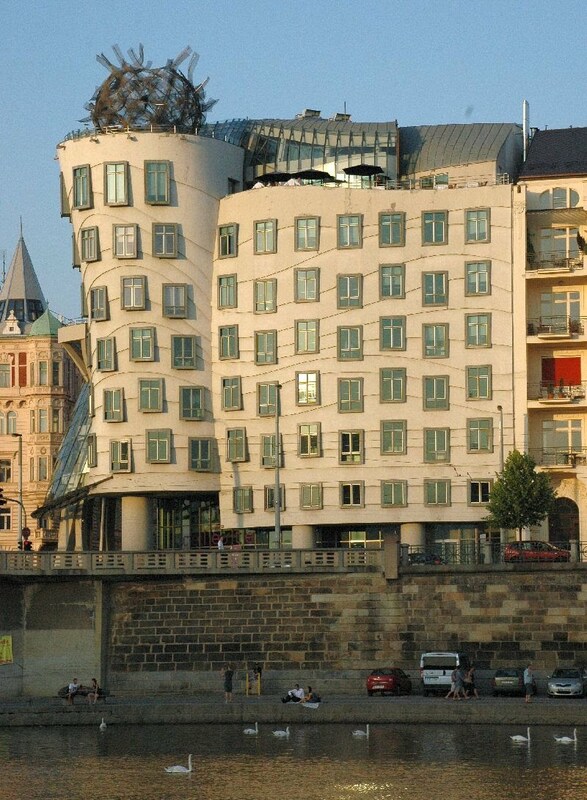 The architects were the Canadian-born architect Frank Gehry (born 1929) and the Croatian architect Vlado Milunić (born 1941). The structure is to represent the dancing couple Ginger Rogers (1911-1995) and Fred Astair (1899-1987).